Mateusz Perkowski/Capital Press Peter Sherman and his wife, Carin, help their son, Liam, and daughter, Emma, pick out pumpkins at a farm on Sauvie Island near Portland, Ore. experts say agritourism operations require common sense to prevent injuries and insurance coverage in case they occur anyway. Pumpkin farmer Matt Roloff says the prospect of calamity doesn’t dissuade him from opening his property north of Hillsboro, Ore., to the public each year. Roloff said he tries to use common sense when designing attractions at his 34-acre farm, which features a tree fort, pirate ship, medieval caste and Western town, among other constructions. Liability and insurance issues, along with regulatory and legal constraints, are among the top challenges faced by agritourism operators, according to a survey by University of California Cooperative Extension. Obtaining a policy that covers agritourism activities is now easier than it has been in the past, said Ryan Justus, a farm specialist at Premier Northwest Insurance. “More people are doing it and more people are offering it,” he said. Even so, coverage remains a financial hurdle for some farmers because insurance companies see agritourism operations as having a high exposure to risk, Justus said. “Is it cheap insurance? No, it’s not. It’s expensive,” he said. Premiums for agritourism insurance typically run from about $2,500 to $5,000 per year and must be purchased on top of regular policies that cover buildings and equipment, Justus said. 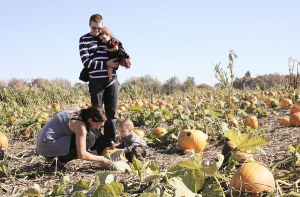 The cost of insurance goes up based on revenues as well as the types of activities involved — a pumpkin patch and corn maze will be cheaper to cover than a hay ride and inflatable bouncy castle, he said. The insured farmer has to be found negligent before an insurance provider will pay out a claim — with serious injuries, the company will send in investigators to determine if negligence was to blame, he said. Generally, an attorney for the injured visitor will send a letter seeking damages, which prompts the farmer’s insurer to get involved, Justus said. In some cases, the farmer will admit he was liable. If the parties disagree about negligence, the case goes to court, he said. It’s important for farmers to fully inform their insurer about the activities offered at the operation so they’re not exposed to too much risk, said Brian Bauman of Bauman Farms near Gervais, Ore.
“The activities get adjusted and changed to make sure we’re doing the best job we can,” Bauman said. Concerns about injuries have prompted Roloff to scrap some ideas, such as a wall that visitors could climb over with the help of a net. “We decided the risk wasn’t worth the reward,” he said. Roloff said he mitigates risk by ensuring that parents enter the property with their children, rather than letting their kids run around unsupervised. “You have to use really good judgment,” he said. Some growers have visitors sign “hold harmless” waivers, in which they acknowledge the risk of entering the operation and waive claims for damages, said Melissa Fery, a small farms extension agent with Oregon State University. Such waivers shouldn’t replace insurance coverage — a farmer can still face lawsuits alleging negligence — but they provide visitors with additional awareness of the hazards, she said.